Exactly 3 years ago in (almost always) sunny Manila, The Cheese Steak Shop opened its doors to the hungry public of the Philippines. That was the time when my taste buds were elevated to higher standards of cheese steak sandwich appreciation. "This is the REAL thing" my mind has been telling me. I've later found my favorites such as the Breakfast Cheese Steak paired with a cup of crunchy onion rings. I knew that when we left Manila, this will be one of those restaurants that I'll miss terribly. Oh for two years, I continued to long for that delicious piece of cheese steak sandwich that's packed with thinly-sliced tender beef and a generous serving of veggies. How I wish they'd come to Singapore. Just like that, my wish was granted! 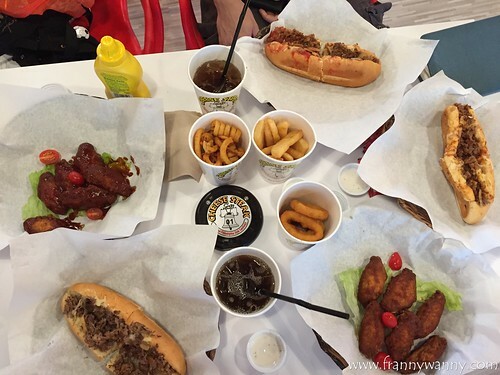 A month ago, Paul, O and I went to Kallang Wave Mall to check out the newly opened Cheese Steak Shop. O hasn't tried the one in Manila but hearing how Paul and I continue to rave about it, I can sense that he was pretty excited to try it out himself. Yay for fellow foodie friends! Since we missed Cheese Steak Shop very much, we went a little overboard in ordering our food. It was pretty much a case of "oohh I want to try this..and that...oh and that too...how about this..." you get the gist. Paul always loves sticking to the basic. Whenever we have burger, he'd go for the original flavored ones with the usual toppings -- lettuce, cheese and tomatoes. Despite the long list of fancier versions, he'd always stick to the basic ones. Just like for his cheese steak, no amount of prodding for him to try something more fancy could make him change his mind. He's truly a no-frills guy who likes it simple, straight-forward yet truly satisfying. Trust O to be really adventurous with his food. This is one reason why food tripping with him is always so fun because he would be the one who'd gamely order the unique dishes on the menu. More often than not, he has been pretty lucky as his choices are always so yummy. 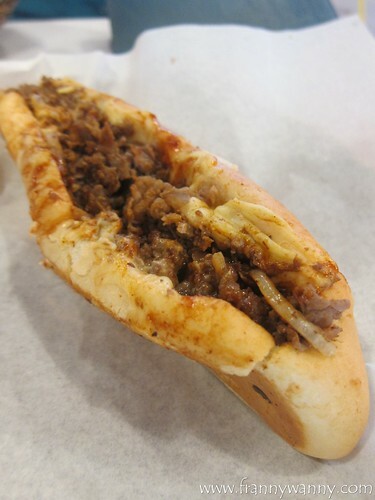 I was able to try a bit of O's Deluxe Cheesesteak and I have to say that this is one that I'll order on my second visit. 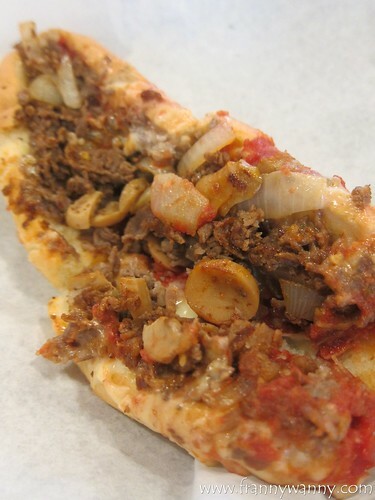 It's an upgraded version of the Pizza Cheesesteak due to the inclusions of tomato sauce and mushrooms. Yum! To go with our sandwiches, we just had to have some sides. Luckily, we each had our own favorites so no fighting over the yummy side dishes occurred. 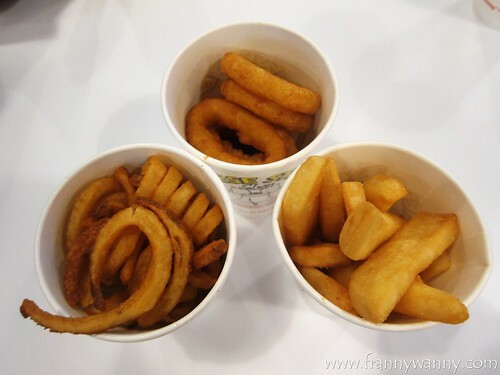 I have been pretty loyal to the Onion Rings and I'm glad that the Singapore version was just as crispy and delicious. O enjoyed the Steak Fries which seems hand-cut judging from its thick, chunky shape. Meanwhile, Paul was pleased with the Twister Fries which I have to agree could rival the famous McDonald's version. 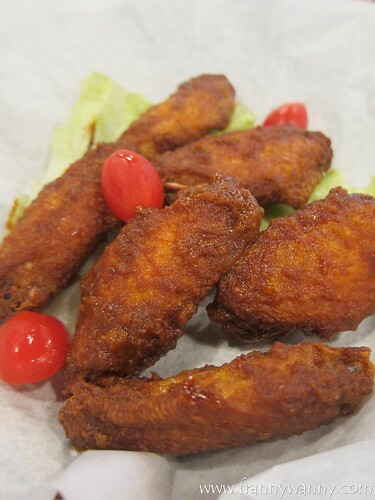 We also tried the Buffalo Wings (S$5.90/S$7.90) which came in two flavors. One was the regular, slightly spicy buffalo wings while the other had a spicy sambal flavor. I personally preferred the original classic version and I wish this would be served with some blue cheese. 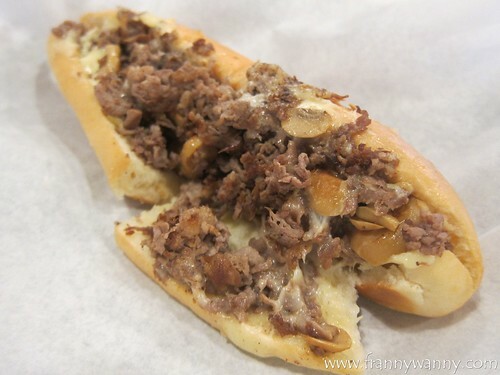 The Cheese Steak Shop is really the place to enjoy authentic Philly Cheese Steak at such reasonable prices. Be sure to always get a cup of sides with your sandwich for a better dining experience. Check out Cheese Steak Shop at No. 1 Stadium Place, #01-10 Kallang Wave Mall, Sports Hub in Singapore. I like more the Classic Philly Cheesesteak. yum yum yum!